Departure Points: Florence & Tuscany or anywhere in Umbria. Perugia & Assisi Private Tour Includes: Our Perugia and Assisi private tour includes transportation, services of your English-speaking driving guide, taxes, tolls and parking. 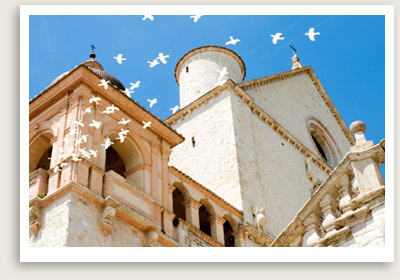 Assisi is also known for its well-preserved medieval Roman architecture. Your Assisi private tour starts from the town’s heights, stopping at the church of St. Claire, a great example of Italian Gothic architecture containing precious paintings, the famous crucifix venerated by St. Francis, and St. Claire’s crypt. You will move towards the old Roman forum, where you can see the 1st-century Roman temple of Minerva, the 13th-century Palazzo del Capitano del Popolo, and the 14th century Palazzo dei Priori. 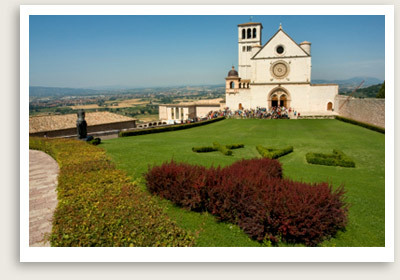 You will finally take the main road downhill to the main attraction of Assisi, the Basilica.